Party like you’re in the French Quarter with Fundaze and Holidaze’s huge selection of Mardi Gras decorations and wearables! Get in the New Orleans spirit with masks, beads, hats and so much more! 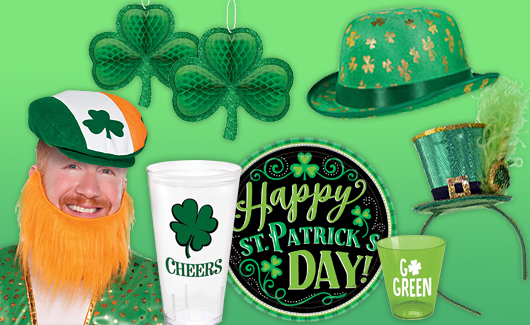 Embrace the luck o’ the Irish with Fundaze & Holidaze’s selection of St. Patrick’s Day decorations and accessories! Shamrock tableware, fun drinkware, and festive décor can set the scene. Then, Fundaze & Holidaze can help you get green with a huge variety of St Patrick’s Day themed hats, glasses, beads and accessories!